How to create a gorgeous, low maintenance garden! Here are some time saving tips to ensure your garden is kept looking great without you putting in the hours! 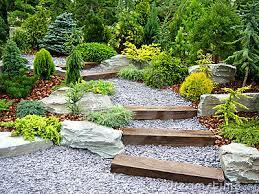 You can also cut back on gardening chores by considering the style of garden you plant. For example, native meadow grasses and flowers that only need to be mowed once a year are a great addition to a good-size backyard. Learn how to choose the right plants that tell you how much time you have to give to your plants. For example, you'll want to avoid fast-spreading perennials such as yarrow or bee balm and opt instead for an easy to grow shrub like compact azaleas or heather. If you don't have a lot of time to fertilize, water, and mow, you'll definetely want to plant an area of your yard with a thick-growing ground cover like pachysandra or wild ginger. A self-sustaining meadow filled with black-eyed Susans & Shasta daisies. Consider container gardening. This is a great style of gardening because you can use a number of containers that you may already have at home. Strong candidates for container gardens include annuals like pansies and sweet peas as well as such perennials as daylilies and oxalis. Some great annual and perennial flowers for container gardening include yellow coneflower, morning glory vine, big blue lily turf, and multiple species of marigold.